On Thursday, January 31, 2019, Robert J. Wychulis, loving husband and father of four children, passed away at the age of 78 at his residence in Eagle Rock. Robert (Bob) was born on March 15, 1940, in Shenandoah, PA, a son of the late Blanche (Sadusky) and William Wychulis. He was a former member of the former St. George's Church in Shenandoah. He served in the U.S. Navy and attended King’s College in Wilkes-Barre, PA on a football scholarship. He worked as an Investigator for the U.S. General Accountablitity Office and retired in 1995. Bob had a passion for the outdoors and loved being on the water and fishing. He spent many years boating with his family and fishing on the Chesapeake Bay and made annual fishing trips to Canada for 30 years with his son. Bob was an all around athlete and played basketball in high school, football in college, and spent a lifetime golfing, running, skiing, and playing cards with his family. He enjoyed drinking a martini and cooking dinner. 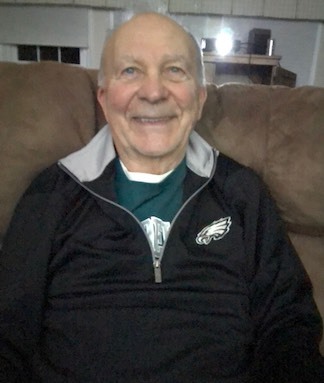 He was an avid Eagles fan and was the founding father of the family’s Eagles fan club. In his later years, his favorite form of recreation was driving his car, “The Ultimate” around town. Bob was an avid reader and had a passion for politics and astronomy. Bob was known for his quick wit, his infectious smile, and his kind and compassionate spirit. He is survived by his wife of 54 years, Johanna Wychulis (Rittle) and children: daughter Karla, wife of Jeff Yeakle, of Laytonsville, MD; daughter Kristen Wychulis, of Arlington, VA; son Robert E. Wychulis, of Laytonsville, MD; and, daughter Amy, wife of Steve Vallance, of Mt. Airy, MD. He is also survived by grandchildren Bradford Yeakle, Victoria Yeakle, Jonah Wychulis, Alanna Greene, Quinn Greene, Brady Greene, and Braeden Vallance. Graveside services for the family will be held at 10:00am on Monday, April 8th at Our Lady of Fatima Cemetery in Shenandoah Heights. The family will host a celebration of Bob’s life in Maryland in June 2019. Roberts family respectfully requests NO FLOWERS and that memorial donations in his memory be made to the American Cancer Society in his name.